Books in a Bag makes selecting books for your book club easy. There is a large list of books available that range from popular books to classics. 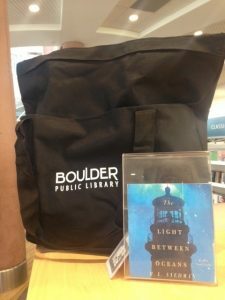 Boulder Public Library staff members put eight copies of your chosen book together with background material and discussion questions, so you are completely prepared. Books in a Bag can be checked out by anyone with a library card. Books should be returned in the bag given to you at the staff desk before you check out another bag. Get started on getting the next good read for your book group with our Books in a Bag!